Images: Loon by Once Upon A Stamp Canadian Goose by Visions of Ink. Pine Branch by Just for Fun. Clump of Grass by A Stamp in the Hand Co. Pines & Rocks 195G, Lakeside Cove Lg. 049G, Cloud w/Rising Moon 197E, & Water Pattern 092E by Stampscapes®. Note: This is a good example of spotlighting in a scene. 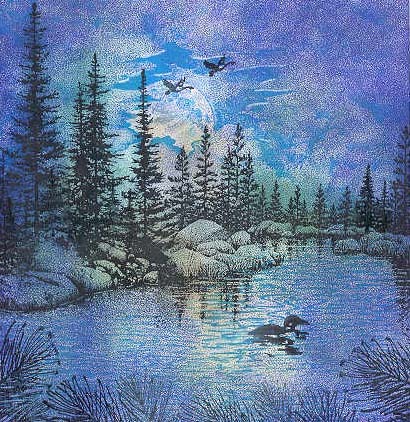 The loon swims through the water in the warm glow of the moon's reflection. Without that area of light, the loon would be lost in the darkness.